Kevin Kenner has performed as a soloist with world-class orchestras including the Hallé Orchestra, the BBC Symphony Orchestra, the Berlin Symphony Orchestra, the Warsaw Philharmonic, the Czech Philharmonic, the Belgian Radio and Television Philharmonic, the NHK Symphony of Japan, and in the US with the principal orchestras of San Francisco, San Diego, Salt Lake City, Kansas City, New Jersey, Rochester, Baltimore, St. Paul and many others. He has been invited to perform chamber music with illustrious string quartets such as the Belcea, Tokyo, Endellion, Vogler and Panocha to name but a few. He has been invited to adjudicate in some of the most celebrated international piano competitions in Asia, Europe and the US. And in 2010 he comes full circle, having been asked to serve as a juror on the next International Chopin Competition, where he won the top prize in 1990, as well as the bronze medal in the Tchaikovsky International Caompetition and the International Terrence Judd Award in London. Kevin Kenner's recordings are distributed internationally and include many discs of Chopin works as well as recordings of Ravel, Schumann, Beethoven and Piazzolla. The Washington Post recently proclaimed him "a major talent. 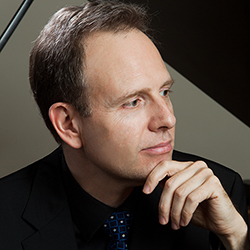 . . an artist whose intellect, imagination and pianism speak powerfully and eloquently." The conductor Stanislaw Skrowaczewski, who recorded with pianists such as Artur Rubinstein, claimed Kenner's Chopin interpretations to be the most sensitive and beautiful he remembered. Old First Church is a unique venue to hear this superb artist at close range and with brilliant acoustics. We urge you not to miss it! The concert takes place at 4 PM on Sunday, March 3rd, 2019.